Turkey’s Deputy Prime Minister Numan Kurtulmus said the Iraqi Prime Minister “must make statements lowering the tension.” He claimed that the deployment is “more of a precaution than a threat” because Ankara has to “take measures to guard against threats from across Turkey’s border.” Turkey shares a 350 kilometer long border with Iraq. 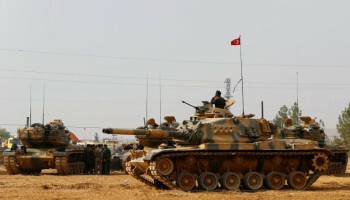 Some Turkish forces are already stationed in Iraq around the Basiqa military base for the past several months and Baghdad’s request for their departure had led to a war of words between the two governments. Abadi, during his latest warning to Turkey on Tuesday, pointed out that the “door of diplomacy” remains open despite being ready for any eventual circumstances that may arise with their neighbors. Such remarks will in no way defuse tension between the two neighboring countries. Written by: Peter Mulvany on November 3, 2016. Posted by Peter Mulvany on Nov 3 2016. Filed under Headlines, World News. You can follow any responses to this entry through the RSS 2.0. Both comments and pings are currently closed.